The New York Times reports that United and US Airways are in talks about a possible merger that would create the world’s second largest airline. As is usually the case with mergers, there’s no clear sense of how far discussions have gone. The Times‘ Deal Book blog said the two sides are “deep in their merger discussions,” but there is still a ways to go, with no guarantee that a deal will be struck. Still, these two airlines are no stranger to mergers. United recently tried to merge with Continental, only to see Continental opt for membership in star alliance (which includes United) instead. US Airways completed an occasionally sloppy merger with America West a few years ago. More importantly, perhaps, is that this isn’t the first time United and US Airways have gone into merger discussions with each other. 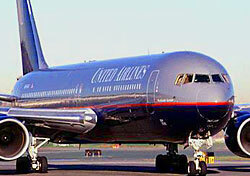 The two airlines actually completed a deal in 2000, only to withdraw due to antitrust concerns and union pressure. They talked again in 2008, but couldn’t come to an agreement. Perhaps a third time will be the charm. Now, would a merger between these two airlines make sense? Yes and no. For much smaller US Airways, the clear benefit is United’s strong international network, including a strong presence in the transpacific market. Domestically, however, things get messy. Both airlines have extensive domestic networks with several hubs each, which suggests heavy consolidation, and possibly layoffs, could be part of the deal. Further, neither airline is exactly a consumer favorite, so one wonders if the combination of two scuffling brands would attract new customers. Speaking of customers, it’s a little too soon to say how the merger will effect the traveling public. George Hobica, at our sister site, Airfarewatchdog, says “it doesn’t take an M.B.A. to figure out that fares would rise should United and US Airways merge,” but that we shouldn’t panic just yet. Readers, do you think a United-US Airways merger would be good for the industry? Would it impact your travels in any foreseeable way? Leave a comment below.